I've questioned whether or not John Almond was the son of Rebecca Lambert Almond. He was without doubt, the son of her husband Pleasant Almond. John was one of the two favored sons of Pleasant Almond and one of only two left anything in his will. The other was Ervin Nelson Almond, the youngest, who in the marriage license to his second wife, revealed his mother was Barbara "Barbary" Pliler (Plyler) Honeycutt, the abandoned wife of Isham Honeycutt. She was living next to Pleasant and Ervin in the 1850 census and also next to her sister and brother-in-law, Frederick and Sophia Pliler Myers. Was the birth of John the catalyst to cause Isham to leave Barbara in Stanly County while he migrated with other Honeycutt family members to Sumner County, Tennessee? Or was John just the only child of the marriage of Pleasant and Rebecca to side with his father when the couple split up, shortly after the birth of Calvin Almond? There's no way to really know. Perhaps some descendants can use dna to compare themselves with descendants of Ervin, the Lamberts and western descendants of Isham Honeycutt by his third wife, Hulda. One interesting fact about John Almond was that he evidentally rivaled the reknown Duggar family in that he fathered 19 children with one wife, Margaret L Blackwelder Almond. Margaret outlived her husband by about 9 years. G. F. Almond mentioned in the above article was George Franklin Almond. Another article, previously, in 1902, in the Charlotte Observer, confirms the fact that there were 19 children. The question is, who were the 19 children? To look at John, we have the opportune ability to see his family listed in the 4 most informative census records of the 19th century. Born in 1826, he was too young to have headed a family in 1840, so the 1850 is his first. 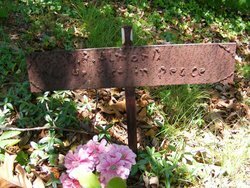 He was not with his father in 1840 in Cherokee County, so it is unknown where he could have been living. Neither Rebecca Lambert Almond or Barbary Pliler Honeycutt, his two possible mothers, where enumerated in 1840 as heads of their own households. In 1850, John is 24 and his young bride, Margaret Blackwelder Almond is 17. Their first son, Rufus is a year old. The young family is positioned between Barbary Honeycutt, who was Pleasants' mistress, and at least the mother of his youngest son, Nelson Ervin Almond. Pleasant is listed on the other side of her. Below John's name is the Frederick and Sophia Myers family. Sophia Pliler Myers was the sister of Barbara Pliler Honeycutt. Oddly, Pleasants father-in-law, the Rev. John Lambert, also lives nearby. There must have been tension in that neighborhood. Young Ervin was living with his father. Rufus Alexander Almond is without arguement, the oldest child of John and Margaret Almond. He is the only child yet born in 1850. Since Margaret is so young, even though no marriage license has been discovered, they were probably married in 1848. Margaret would have only been 14, but as Rufus was born in 1849, that would give them a year for his conception and gestation. The name Rufus Alexander runs through the Lambert family. I have a direct ancestor, Rufus Alexander Lambert, my second Great Grandfather, in fact. With John's eldest son named Rufus Alexander, this adds creedence to him being a son of Rebecca Lambert Almond. Perhaps he just sided with his father in the dispute that separated his parents and that is why he was one of only two sons left anything in Pleasant's will. By 1860, John is farming a modest piece of land. He appears to be living in the same area, as although some of the neighbors being changed, there being more Finks and Blackwelders, German-descended families who originated with the Dutch Creek Settlement near Mount Pleasant in Cabarrus County, as they lived near the Stanly/Cabarrus line, he still lives near Elizabeth Shoe, an 1850 neighbor, and the Lamberts who created their own spreadout community. The family has increased from one to eight children, mostly boys: Rufus, Ransom, Sarah, Daniel, Alfred, Wilson, James and Pleasant. Alfred may have been named for John's brother. Pleasant was obviously named for his father, and Sarah may have been named for Margaret's mother, Sarah Susanna Misenheimer Blackwelder. Willaim and John Howey of Mecklenburg County, NC, Father and son. Then came war, and John Almond was swept up to serve, along with his brothers, Calvin and Ervin. He served in the 42nd Regiment, Company H. The 42nd Regiment, North Carolina Infantry was organized at Salisbury in April of 1862. It surrendered on April 26, 1865 with the Army of Tennesee and included many men from Stanly County. The Almonds, like the Lamberts, and most other yeoman farmers of their area, did not own slaves. This was not what the war was about for them. We can not know their mindset as we did not live in their era or walk in their shoes. Enlisted 25 March 1862 in Stanly County, North Carolina. Deserted 2 August 1863. Rejoined from desertion on 20 October 1863. Deserted again 17 August 1864. Rejoined from desertion 29 October 1864. Captured at Mount Kingston, North Carolina, on 10 March 1865 and transferred to Point Lookout, Maryland, on 16 March. Released 22 June 1865 after taking the Oath of Allegiance. Current political and social flow serve to present these men in a negative light as evil men who were fighting to preserve slavery. That issue may have been a concern of the rich, those families with large tracts of land whose profits and prosperity were dependant on slave labor. Many of those families had sons who were able to avoid war by education or by hiring substitures to serve in their place. But the Almonds and Lambert and others of these Western Stanly and Eastern Cabarrus subsistence farmers were not in that elite group. Their motivations were probably more of duty, of protecting their wives and children and what little they had from an invasion from the North, not of protecting the lifestyles and vanities of the upper class or preserving a cruel, evil and inhumane institution of which they had no part in. Bost Grist Mill on Rocky River near Georgetown. John Almond survived when many others of his generation did not. He returned to a land where in the course of the war, fields had gone untended, stores had dwindled and hopes had died. The population was overwhelmingly old men and young boys and a soberingly high percentage of widows and orphans. Although Stanly had been spared the wrath of Sherman once his lackeys realized they had crossed wealthy and plantation-lined Anson and were headed to an area where the populous had voted against sucession, but had been overruled and were relunctant soldiers for the most part, she was not without devastation of her own kind. There were reports in the Salisbury papers and notations of history that groups of women and chidlren, starving, from the southern and western portions of the county, had stormed the coffers of the town of Albemarle, demanding grain and supplies. Fayetteville, NC Civil War era. John Almond's family had increased to 11 children by 1870. Oldest son, Rufus, who was not included with his family, would have been 21. He may have been working somewhere, and escaped enumeration. He may have traveled temporarily to another State or County to try his fortunes. He may have been in school somewhere, but he shows back up. Pleasant Almond II was also missing. He would have been only 11 and should have been with his family. He does not show back up. The natural assumption would be that he passed away before 1870, in his childhood. By 1880, all of the known younger children have been born. John Wilson Almond was married, but still living at home helping his father in the fields. The 20 year old 'Laurace' listed was his wife, Laura Scena Carter Almond. The older sons have started their own families. As there is no 1890 census the next census is a 20 year jump. John Almond is now in his 60's and he and Margaret are living only with their daughter, Amanda. The date of death for John Almond is given as January 11, 1902. A John Almond family cemetery is located off of Canton Road outside of Albemarle, in Stanly County. I believe this is the cemetery of this John Almond, but I could be incorrect. 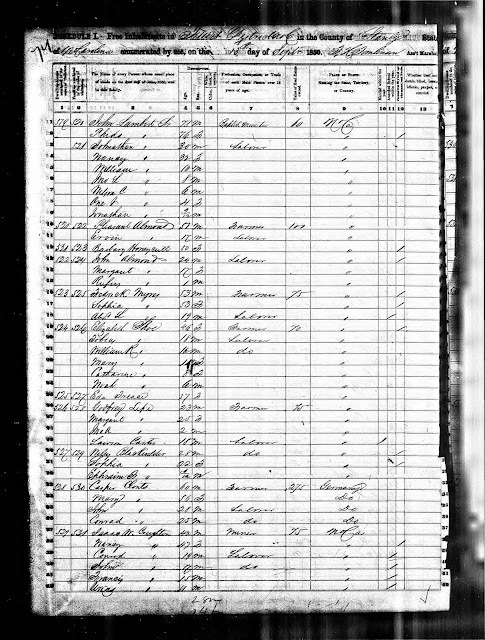 Margeret Blackwelder Almond outlived her husband and appears in the 1910 census living with her daughter Amanda, Amanda's daughter, Bertha and Amanda's husband, Ephraim Hatley and his family. She was the mother of 19 children with 14 living. I) Rufus Alexander Almond born: November 7, 1849 Died: July 14, 1918. Married: Martha Jane "Patsy" Whitley. Served as Postmaster of the Community of Mission, Stanly County. 6 children: David Anderson, Adam, Pierson Albert, Lentz Ivy, Eliza Jane and Verdie Henderson Almond. Married 1st: Roena Serena "Rena" Starnes. 5 children: Luther, Mary Almond Lambert, Julia Almond Crayton, George Franklin, William M.
Married 2nd: Melissa Ann "Lissie" Honeycutt. III Sarah Elizabeth Almond Born: February 14, 1853 Died December 28, 1928. "Max Riceberg". Her only son, George, was born in 1891 and took Sarah's name. IV) Daniel J Almond Born: Abt 1854 Died: Likley before 1910. In Rowan County, NC. 1 child: William Victor Almond. 2 children: Annie Wilhelmina Almond Kalogrides and Mary Agnes Almond (Allman). Note: The 1900 and 1910 census records indicate that Eliza had 5 children total, but only these two daughters lived. Names of the other three who died as infants or small chidren are unknown. Now, the position of Child number 6 in the family procession is a little sketchy. In some trees, I have seen a son named "Nelson" , born in 1856, the year after Alfred, inserted. These folks may be direct-line Almonds who have had access to a family bible, or even family history handed down the line, that indicated there was a Nelson, and the name does make sense, as it is a name that runs in this family. However, there was never a Nelson in the census, nor have I found a grave for him. So, I will leave Nelson as a possible son who died as a child, before census records. Then there are the jockeying positions of George Franklin and James. In the 1860 census, a two year old James appears, older than Pleasant and younger than Alfred and Wilson, age 4. Yet, despite their death records and other records giving Wilson a birth year of 1860, and James one of 1865. I suppose there is a possibility of there being two Wilson's and two James's, with 1856 Wilson and 1858 James, both dying of some deadly, dreadful childhood disease and then 1860 Wilson and 1865 James being named for their deceased brothers. But it could be as they became older, they also became confused of their ages and gave their families the wrong years of their birth. One who should have been in the 1860 census, and was not, was George Franklin Almond, who was supposedly born in 1858. Perhaps 2 year old "James" in 1860 was actually George Franklin, and his name entered incorrectly. So, for all practical purposes, I am just going to list George Franklin next, as he could have been the 6th, 7th, or 8th child born. Married 1st: Lourella Jane Morton 3 children: Lawson McDaniel, Craven Jerome and Ethel Mae Almond Gafney. Married 2nd Lesta Ballard 1 son: Coolidge Franklin Almond. VII) Pleasant Almond Born about 1859 and died before 1870. Appears only in the 1860 census. The next position in the family line is also controversial. Some family trees have an Elizabeth Almond being born on November 4, 1859, being born, death unknown. This could also be a child that died as an infant listed in a family bible I have not seen. VIII) John Wilson Almond Born: March 5, 1860 Died: July 19, 1933 (These are the dates given by his Death Certificate and tombstone, note though, that a Wilson shows up as 4 years old in the 1860 census). Married: Fannie Larcena Carter 8 children: Mathew Monroe, Margaret "Maggie" (Almond Leonard Cooper), Titus Deberry, Eben H., Jerome Napolean, Nora S. Almond Sell, Grover Wilson, Scena Olivet Almond Lambert. IX) Martha J "Mattie" Almond Born: September 2, 1860 Died Feb 7, 1929 (Note: Wilson and Mattie could not have been that close in age and be born to the same mother. As "Wilson" shows up as a 4 year old in the 1860 census, I believe the year of his birth is wrong and that he was born between Alfred in 1855 and G. F. in 1858. Married: Martha "Mattie" Jane Herrin 8 children: Polly Eva Ann Almond Cauble, Silas Stephen "Sike" Almond (Allman), Richard Cleveland Almond, John Rufus Almond, Rayvon B Almond, Gathie Marina Almond Eudy, Mary J (died as child), Paul Lee Almond, Bessie Louise Almond Earnhardt. Married 1st: Alphonso Allen Almond Widowed: 5 children: Lillie Jane "Lottie" Almond Tucker, Hester "Hettie" Jane Almond Simpson, Lemuel Ransom Almond, Samuel Burton Almond, and Adam Alphonso Almond. Married 2nd Duncan Burris Divorced: 2 children: Carl Gordon Burris and a girl infant that died tragically and cruelly as described in the divorce papers. (Note: I've posted on Oma before, as she holds another place in my family tree, due to her marriage to Duncan Burris and their divorce. Duncan Burris was the brother of my Great Grandmother on my paternal grandfather's side. After he and Oma were divorced, he married my Great Grandmother on my paternal grandmother's side. He raised my grandmother as her father died before her birth. This marriage was also tragic and left scars on my grandmother indefinately. It was through this relationship that my grandparents became acquainted, however, and led to the birth of my father. Married Valeria Elizabeth Jones 9 children: (They spelled their surname "Allman") Roy Conrad, Edmund Dawson, Jonas Alton, Savannah Irene Allman Miles, Corrilee Allman Worsham, James Franklin, Annie Ruth Allman Ferguson, Louis Clyde, Morris Wilson "Potsie" Allman. Married: Emsley Beasley Harwood 15 children: Frances "Francie" M Harwood, Grace Ellen Harwood Almond, John Cleveland Harwood, Effie R H. Coxie, Lotha Jennibel Harwood Blalock, Sarah L Harwood, Cora Alice Harwood, Carrie Lee H. Dennis, Rilla Julia H. Foster, Fannie Mae H. Furr, Theodore Vanburen Harwood, Delilah Louise "Dallie" H. Cauble, Ellis Pearson Harwood, Carl H Harwood, Pearl Harwood, Emsley Britton Harwood. Married Adam Ephraim Hatley: 5 children: Lawton Henry Hatley, Palmer Lincoln Hatley, Berry Ervin Hatley, Nealie Gertrude Viola Hatley Almond, Edna Louise Hatley. Married: Charles Monroe Shoe: 3 children: Hurely Deberry Shoe, Dewey R. Shoe, Marvin Leroy Shoe. That adds up to 16. There were 19. Could some of the missing be Nelson, Elizabeth and either 2 different sons named James or Wilson, having died as children and subsequent sons named for them? Things to ponder: Why did so many of John Almond's daughters have children out of wedlock? Was John then perhaps illegitimate himself? The son of Pleasant and Barbara Plieler Honeycutt? Did this put the family in a different social class in the community? Why did so many of the grandchildren of John Almond carry the name Deberry in their name? There was a "Deberry line" consistently mentioned in the land records of this area. Who was this Deberry? Could he have been an ancestor of this family? If so, when and how?